Lou Xiaoying, right, lies in the hospital with one of her daughters, center. Lou, now 88 and suffering from kidney failure, found and raised more than 30 abandoned babies from the streets of Jinhua, in eastern Zhejiang province, China, where she made a living recycling rubbish. BEIJING – “What?! 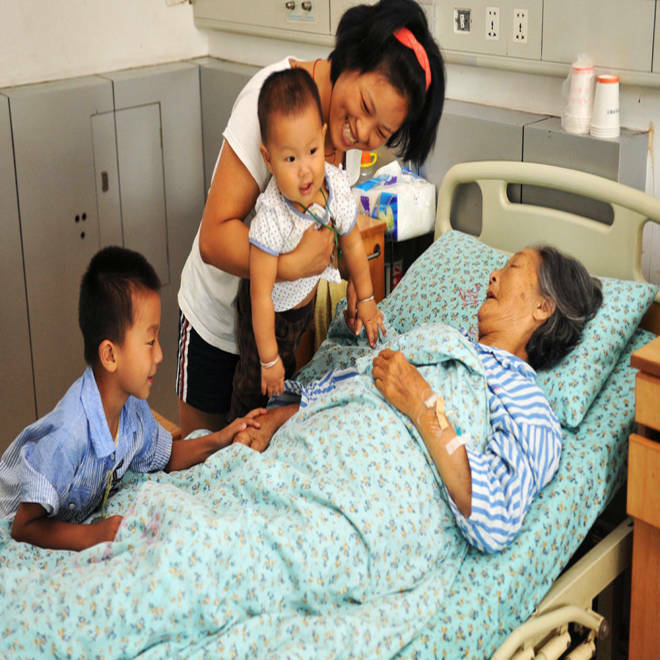 No, she is alive in the hospital,” exclaimed Zhang Jingjing through the phone lines. Zhang was responding to concern on Weibo, China’s popular Twitter-like service, claiming that Lou Xiaoying, her adoptive mother, had died. The worry was understandable, for Lou, 88, has been hailed a hero in China for reportedly saving more than 30 abandoned babies from trash cans and dumps over the past four decades. Lou is suffering from kidney disease in the hospital, but, according to her daughter, she's still alive. "My mother has gotten better,” Zhang, 33, reported. “The hospital has spared us much expense. They have also minimized the kinds of medicines that my mom has to use. Money collected from donations has helped us a lot, too." Lou, who was born in 1924 in Fujian Province, collected and recycled garbage to make a living. She and her husband, who died 17 years ago, had two biological children, a daughter and a son. Over the years of scavenging, Lou found 30 children who had been abandoned, mostly as a result of China’s strict one-child policy. She and her husband adopted three daughters while the remaining children, mostly girls, were passed to other people to start new lives. According to an article in Britain’s Daily Mail, Lou found her first abandoned child, a girl, when she was out collecting garbage in 1972. Zhang told NBC News that "at one point, there were 12 members in the family” living in a deserted temple on the outskirts of the city of Jinhua, about 200 miles south of Shanghai. "It wasn't until 1987 when they were building a railway and wanted to remove our temple, did [authorities] find out about our family,” she added. The family’s future was complicated by the rigid household registration system designed to control the movement of China’s 1.3 billion people. Known in Chinese as hukou, the central government classifies people as either city dwellers or rural peasants, which determines not only a citizen’s residence but also what kind of social services and schools they are eligible for. Because they were living “off the grid,” none of Lou’s adopted children had a hukou. But Zhang said that people in the area soon heard about the family and help came along. "There were some communal donations which helped two of us adopted ones go to school. But my oldest adopted sister, who is now 40, has never gone to school,” said Zhang. Even in old age, Lou kept going out to collect trash several times a day. In 2007, Lou discovered a boy, Zhang Qilin, in a dumpster. She adopted the boy, who is now 7, as her grandson; his adoptive father is Lou’s biological son. The youngster encountered the same problem of not having a hukou. But after a series of reports about Lou in the local Jinhua Daily, followed by other reports in the Chinese and international press, Zhang was granted permission to attend a public school called Jindong District Experimental School in Jinhua. In addition, his hukou registration process is now under way. Fang Qing, the principal of the public school, spoke with NBC News about Lou’s youngest adoptee. “I take for granted that every child in China has a right to education, no matter what his background is like,” Fang said, adding that the school would keep a special eye on Zhang Qilin. “Grandma Lou deserves her dreams to be fulfilled. Good people should be rewarded with good,” Fang said. Many netizens have chimed in on Weibo about Lou’s heroism. “What would the world be like if only we have a few more people like Grandma Lou. I respect you, Grandma,” wrote one user. Lou’s concern for others lives on in her daughter, Zhang, who agreed to be interviewed as long as no foreign donation appeal would be made through NBC.